Happy birthday to my friend Katie in Montreal who sent me her recipe for this delicious veggie chili that I made last night! I’ve really been craving chili recently but I had never made it before. I’ve come across many recipes but they all generally sound too heavy. Then, as I was talking to Katie a few days ago about Sprout & Pea, she told me she makes a pretty mean chili these days. In a medium pot, saute the peppers, onions and carrots for about 5 minutes on medium-high heat. Add chili powder, paprika, cinnamon and bay leaves and saute for another 10-12 minutes. Add tomatoes, bring to boil and cook for another 10 minutes. Add kidney beans and simmer over low-medium heat for about 10-12 minutes or until it starts to thicken. Let cool a little and serve. Great with a little guacamole , some shredded cheddar cheese and Greek yogurt with chopped scallions. Also a great snack to dip some Ezekiel tortilla chips in. 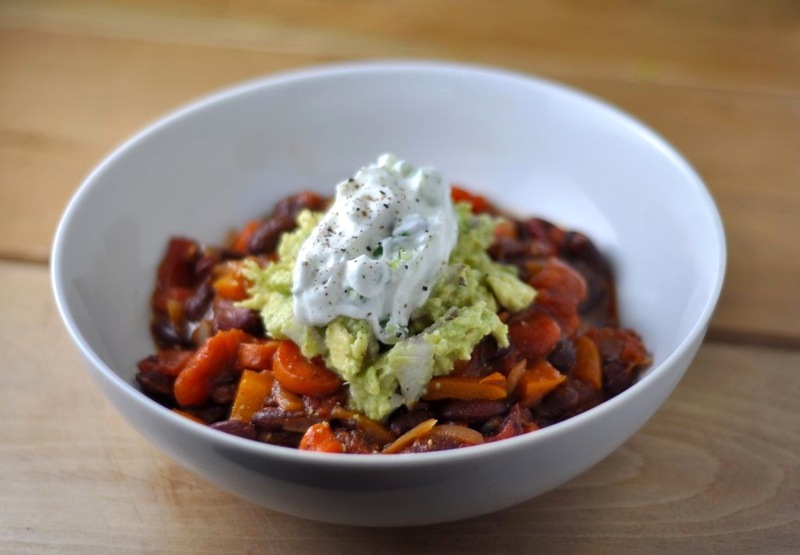 This entry was posted in Recipes and tagged Avocado, bay leaves, carrots, chili powder, Cinnamon, extra virgin olive oil, Ezekiel Tortilla, Greek Yogurt, kidney beans, lime, onions, orange peppers, paprika, photoblog, red onion, scallions. it was so delicious! thanks for the recipe! Yummers. I will definitely give it a try…. This sounds so delightful! And much lighter than regular chili. Will Have to try this one, too. Thanks for sharing! It’s great to find such a good vegetarian restaurant, isn’t it? We have one called City o City here in Denver, and it’s my favorite! Delicious looking chili, and a gorgeous photo! I made vegetarian chili just last week…but I think it’s missing something. I’m going to add some chopped carrots to what I have left (I still have plenty of leftovers!). Otherwise, my recipe was nearly identical to this!